Once you're integrated with our fulfilment app you'll want to start syncing your products. The process for this will be different depending on whether or not you already have existing products listed in your Shopify store, but the method for each is very straightforward. If you haven't already installed our Shopify App then that's your first step. But if you have, let's get started. To sync products you'll first need to log in to your Shopify store or head to your dashboard if you're already logged in. Scroll down and click on the Apps button in the left-hand menu (the one next to a little jigsaw piece icon), then find the Inkthreadable app on your list of installed apps. You'll be prompted to sign in to your Inkthreadable account. So do this, or register an account if you haven't already. Remember: your Shopify store account details and Inkthreadable account details are not linked so they'll likely be (or definitely should be) different. Just for extra security. Once you're logged in you'll see there are three options for syncing your products for fulfilment - linking existing products, creating new ones or managing those already linked. We'll go ahead and start by explaining the process for syncing through creating new products, but if your store already has existing products you can skip ahead to the Linking Existing Products article. Tip: If you want to use printed neck labels with your garments, it's best to set these up before creating any products. To do this, head to your Brand page (or click the 'Edit your brand profile' link at the top right of the app welcome page. If you haven't guessed already, click the Create Products button. 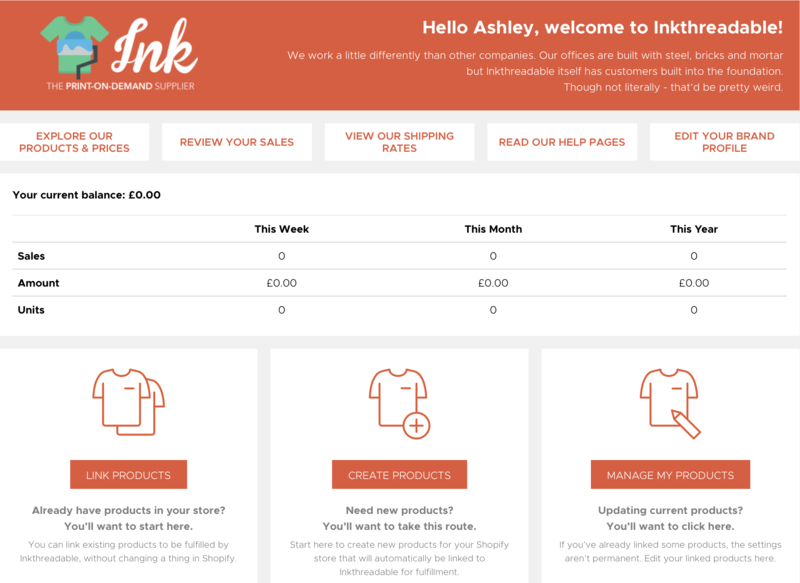 This will load up Inkthreadable's product catalogue for you to select the base product you'd like to use. If you're new to Inkthreadable, the Suggested Products category might be the best place to start when deciding which products to use. Click this, then select a product. For this example, we're going to select Continental Clothing's N03 (but feel free to explore the catalogue and choose anything you like if you'd prefer). When you select a product, the page for it will load up and present you with all the options you need to create your first product. On the left-hand side, you'll see the blank garment with seven icons below. These icons will help you create your product. The first icon you'll need is the upload icon (fourth from the right, an arrow pointing upwards). Click this and navigate to your print file. Once uploaded, you can drag and drop, resize or delete the image from the control panel that appears below the mock. When you're happy with its positioning, click the Create Product button. Your product is now saved to your Inkthreadable account. Next, you want to import this to your Shopify store. To do this, click the import icon (second from the right, the arrow pointing to the right). This page allows you to edit your product information before it's imported to Shopify. Title: The title of your product, what your customer will see when browsing your store. By default, it's a combination of the product you're using and the design title you've added to it, so you more than likely want to change it. Description: This is the description your customers will see when browsing your Shopify product page. By default, this field is populated with basic product information (material, weight, etc). We'd recommend keeping this information since it's useful for your customers, but it's also a good idea to add a little extra information about your design. Brand: You can set up more than one brand, so use this field to select which brand you'd like assigned to this product. Label: Select the brand label you'd like printing in the neck of this garment. The option for a label isn't always available, it just depends what product you're creating. You can find out more about re-labelling here. Resale price: Enter the price you'd like to list this product at in your Shopify store. 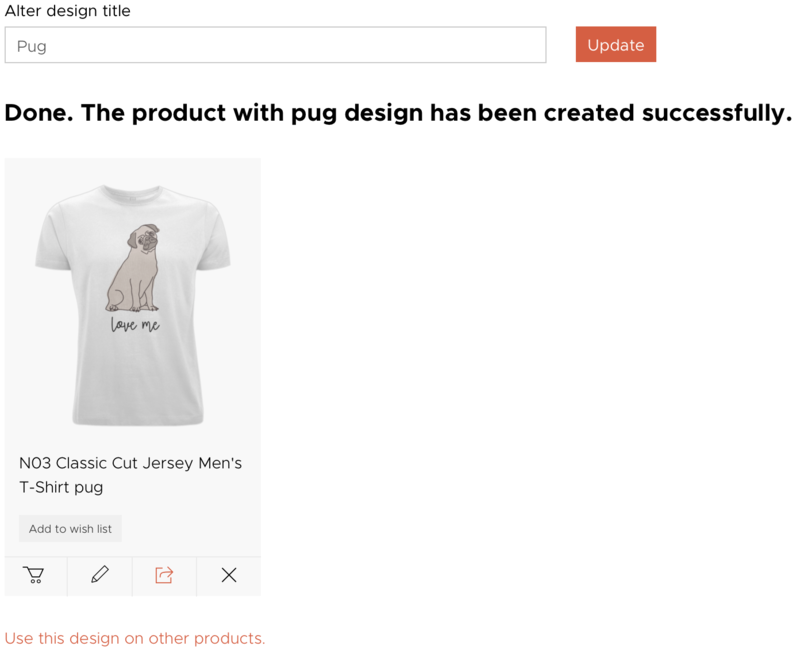 Published: Use this check-box to toggle whether or not you'd like this product published as soon as it's imported to your Shopify store. The options under the Product Options heading will create your product variants in Shopify. 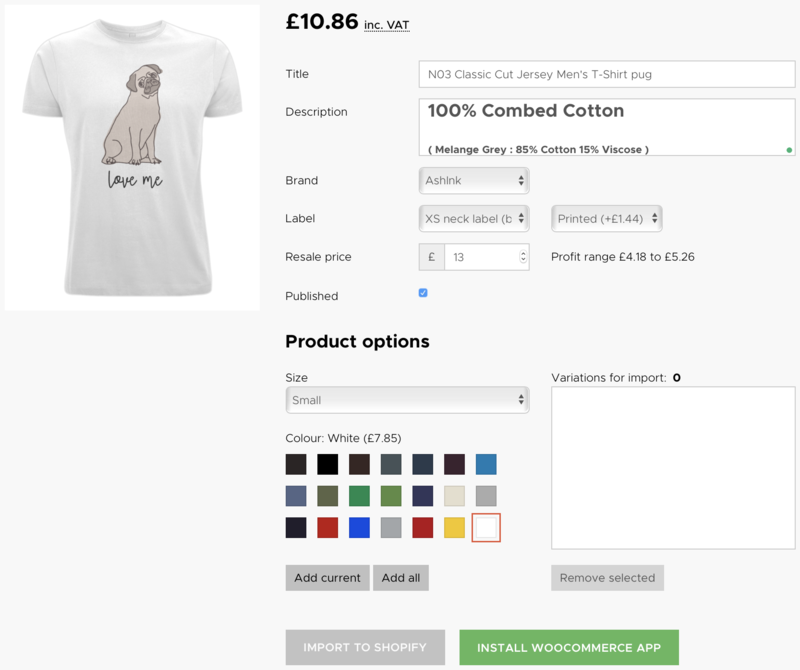 You can add one, multiple or all colours and sizes (and any other variants, depending on the product you're creating). Any variations you add will be added to the 'Variations for Import' box. Once you're happy with your product details and variants, click the Import to Shopify button. When the import has completed, the button will change to View on Shopify. 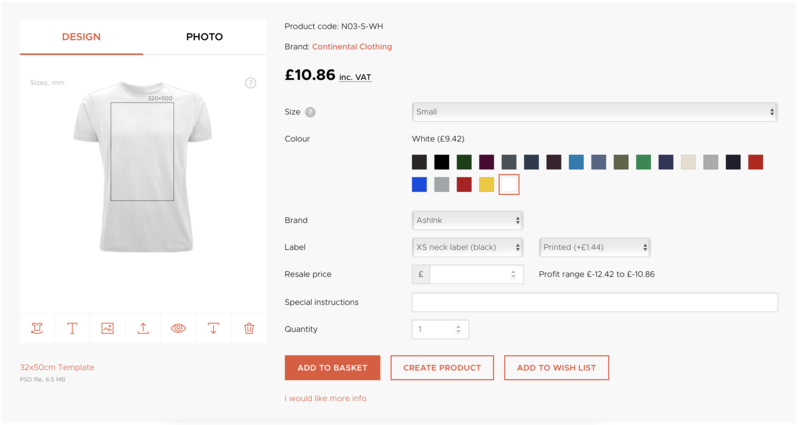 Click this to head straight to your Shopify product page, or you can start the product creation process again to build up your store's product catalogue! If you need any help with creating and importing new products to your Shopify store you can call 01254 777070 or find us on live chat during office hours, or send an email.